Myanmar’s import of consumer goods hit US$1.261 billion during the current 2018-2019 fiscal year, down by $110 million against the same time last 20172018 FY, according to state media. The recent coverage of Chinese blockchain company Shellpay Internet Technology Co’s plan to issue digital coins in eastern Shan has sparked widespread social media attention on the cryptocurrency industry. As the political reconciliation is underway in Myanmar, Shan State Army-South (SSAS) chair, Lieutenant General Yawd Serk, hopes China will play a greater role in the process of achieving peace in the country. Foreign and domestic companies last week signed 28 expressions of interest (EOI) to conduct business worth a potential US$4.9 billion in the state this year. Investors from many countries including Singapore, South Korea, China and India took interested to make more investment in Rakhine State and Singapore topped the investment list in the state, said the state chief minister Nyi Pu. A February 22 meeting between the Private Sector Development Committee led by Vice President U Myint Swe and entrepreneurs from the Union of Myanmar Federation Chamber of Commerce and Industry (UMFCCI) saw the fisheries, steel-making, vehicle manufacturing and distribution and border trade promotion sectors call for policy changes to ease the challenges they face when doing business. A high-level mission of the European Commission and the European External Action Service (EEAS) returned last week (18-22 February 2019) to Myanmar as part of a broader engagement under the EU’s Everything But Arms (EBA) trade preferences scheme. The Yangon Region government appears to be backtracking on a secret deal to lease 26 sites to a private company, Yangon Petrol, following widespread public criticism and pressure from regional lawmakers.? The Office of the Commander-in-Chief said a Myanmar military major was killed during fighting with the Arakan Army (AA) in northern Rakhine State’s Buthidaung Township Friday night, near where the rebel group killed 13 border police officers in early January. A Shanghai blockchain company claimed it intended to set up a special economic zone in a rebel-held border area of eastern Shan State where it would issue digital currencies and IDs to the local population. Myanmar’s Kachin state, a miner recalls how five of his friends died during a landslide two years ago. “I was so scared,” he says. While working in areas where there have been previous landslides, he says he has discovered dead bodies and buried them. Myanmar’s military has filed a complaint with the country’s press council against a respected Japanese daily newspaper for publishing an interview with the Southeast Asian nation’s commander-in-chief without allowing officials to read the text and approve it in advance, according to an RFA report. The prices of lablab pea and rice bean have increased in the Mandalay market on the back of Chinese demand coupled with competitive buying from local warehouses, according to traders in the Mandalay pulses market. A Chinese cultural troupe held performances in Myanmar’s former capital city of Yangon on Sunday night in celebration of Chinese Spring Festival. A proposal that the Myanmar government issue an official response to accusations of human rights violations will be discussed in the Pyidaungsu Hluttaw (Assembly of the Union). Although overpasses have been built to reduce the traffic jams at some intersections along heavily trafficked Pyay Road, congestion still occurs, said U Zin Min Htwe, MP of Dagon Seikkan Constituency (2). MYANMAR’S military on Saturday said they would thwart attempts by leader Aung San Suu Kyi’s party to alter the “essence” of the country’s controversial constitution, putting the army and civilian administration on a collision course over the politically-charged issue. With the aim of enabling all to buy houses, the department has started working on a 30-year installment system of Construction, Housing and Infrastructure Development Bank (CHID), after taking a Housing ODA Loan with the assistance of Japan, said Min Htein, Director-General of Urban and Housing Department yesterday at the opening of Yangon City Gallery at Yangon Region Urban and Housing Department. From the outside, it looked like any ordinary school; children were shrieking, giggling, teasing each other, running around its playpen. Activists and rights workers in Myanmar say the government’s increased crackdown on the media, free speech and peaceful assembly has created a climate of self-censorship and fear within the country. Steve Sandford has this report. At a fruit market in Wanding, Ruili, a county on the China-Myanmar border, workers are transferring watermelons and muskmelons from Myanmar to heavy trucks which will soon leave for Beijing, Shanghai and other cities in China. The Public Works Department of the Ministry of Construction and JFE Engineering Corporation of Japan set up J&M Steel Solutions Co. Ltd as a joint venture in 2014. Under the JV, a steel factory was set up on a 16-acre plot in Thakayta, Yangon, in July the same year. Myanmar invested 40 per cent and Japan 60 per cent in the project, with the permission of the Myanmar Investment Commission. Talking to business owners across a variety of sectors in Yangon in January this year, the mood was universally glum. In the busy streets of Yangon, access to communication appears to be expanding as mobile phone users can be spotted making calls, sending messages and reading news stories from the Internet. The new parliamentary joint committee tasked with amending Myanmar’s constitution will review 48 basic principles of the charter, including the powerful military’s role in politics, amid ongoing objections by the armed forces, the head of the panel on Monday. Thunes, a global cross-border payments network for emerging markets, has partnered with Singapore operator Singtel to enable Myanmar diaspora in Singapore to send money back to their beneficiaries through their mobile devices. Myanmar’s Milling Industry Devastated by New Logging Policies They are crying foul after the impact of a one-year logging ban and restrictive policies. Myanmar’s Timber Merchants Association is crying foul over what they say are the devastating impacts from a one-year logging ban and new, restrictive government policies. Soe Win, secretary of the Association, told domestic media Voice Daily that approximately 80 percent of wood processing plants have been forced to close their doors for lack of timber. The death toll of a fire that broke out at the plywood factory of Honda (Myanmar) Co Ltd on the night of February 18 has reached six, according to Shwepyitha Township Fire Station in Yangon Region. It is important for a country to ensure the rule of law and security for each of its citizens. If they are only assured in some parts of the country, rather than the whole, then, not only would this be a cause for concern for most people, it would also undermine national stability and development. President U Win Myint received a delegation from the Socialist Republic of Viet Nam led by the Minister of Public Security, General To Lam, at the Presidential Palace in Nay Pyi Taw yesterday. To quote a friend in the Myanmar mining industry, “If you want to find elephant-sized mineral deposits, then go hunting in elephant country”. Without a doubt, Myanmar is elephant country. Prime Minister Sheikh Hasina yesterday said Myanmar is not working as per its commitment with Bangladesh on the repatriation of Rohingyas to their homeland in Rakhine. 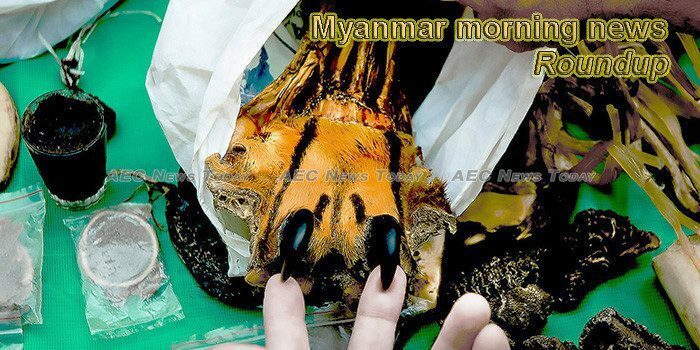 This week’s Myanmar morning news photo acknowledges World Wildlife Day, March 3.